The West Cliff Coastal Enhancement Project started as a proof of concept to demonstrate we could bring native habitat back into the highly invaded and disturbed urban footprint. 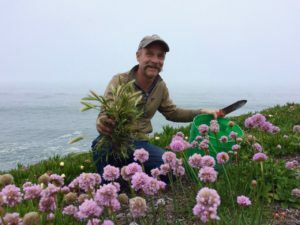 This began in 2013 as a partnership with the City of Santa Cruz on an ice plant removal and restoration demonstration in the form of pocket native plant gardens near the cross streets of West Cliff Drive and Chico, then later Woodrow. The Chico site receives heavy ocean spray and was deeply layered with salt laden ice plant duff (organic matter). The Woodrow site is a shallow soil perched atop an abandoned parking lot. A testament to their hardiness, native plants now flourish at both sites serving as a model for a biodiverse coastline providing habitat for native animals such as pollinators and birds.